Today is a day for resolving family conflicts in a healthy manner. No need for finger pointing and accusations. Simply say how you feel. This is the most honest way to approach things. 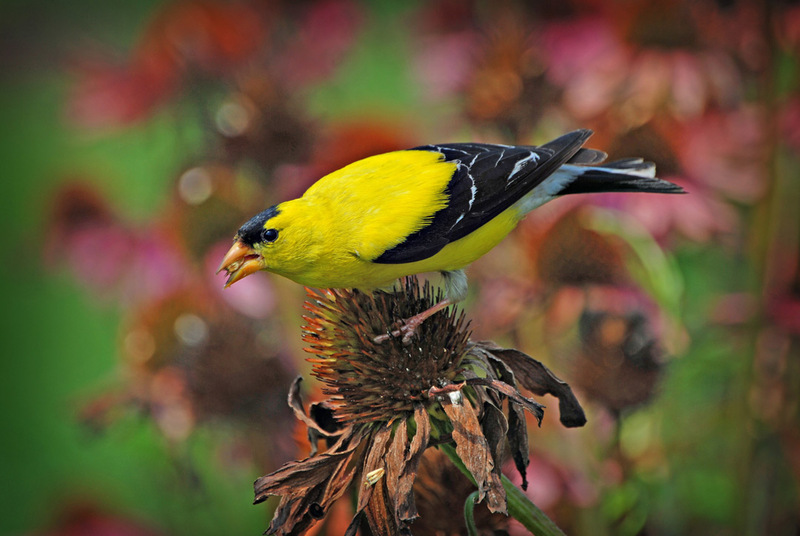 In general, goldfinch symbolism is a sure sign of exuberance, liveliness, and enthusiasm in your current world. Their arrival is to remind you to enjoy life and savor each moment for the joy that is in it. Furthermore, it is also a time to celebrate who you are, your accomplishments or just for the sheer fun of it. Goldfinch meaning symbolizes that life is for you to live. Therefore, each moment you waste on such negative emotions as fear, hatred, and anger is a waste of time. In fact, this bird is all about finding joy in the present moment. Alternatively, goldfinch symbolism could be letting you know that it is time to express yourself. Thus you need to speak up and speak your mind. Be straightforward, kind and thoughtful with your words and all will be resolved. People with the Goldfinch totem are always buoyant and happy in their life. They rarely go about doing things quietly, and their exuberance and enthusiasm are contagious. Folks with this power animal are seldom silent. They are usually humming or singing a tune to themselves. Humans with this spirit animal totem have a close connection to nature and a deep understanding of her ways. They also live on the edge of the spirit world, the fairy realms and, make great animal communicators. These folks know when to listen to their inner voices, and are good at following through. People with this birds’ essence are also gifted healers. They tap into the healing energies of the elemental realm very efficiently. When you have a Goldfinch dream, it usually means that you are happily in love. If you dream of hearing this Gold colored finch sing, it indicates that you are expected to explain your passion. Alternatively, this bird can also be a symbol of your soul, which usually means that happy experiences are coming your way. Occasionally, it can also be an indication of the sacrifices you have made. am wondering what is the meaning when I dream of two sparrows sitting on the ground protecting a fallen goldfinch laying on the ground, in the dream i didn’t want to disturb their peace , I was protective over the birds as well such that people do not attack them while they on guard over the other one. but now am curious what is the meaning of that. Had an interesting day today. Was at the airport working on the system when I heard a crashing noise all along the full length 20m wide windows. I looked up straight away and 12 red browed finches had crashed into the window . I Managed to save 1 but the rest died. Don’t know what made them do that or if there is any significance. Very sad though. Was hoping I would find the answer here. Does anyone know what thst might mean? I am a spiritually guided healer, last night after my client’s session, I was guided to just let her talk. She began reminiscing about her childhood and joy began to sparkle from her face at the same time in spirit – a golden finch flew out of her mouth as I was coaxing her to talk more. I see now this was in alignment with her releasing stress in her life so she could feel this joyous moment she was reliving. what a beautiful website. I’m glad the golden finch brought me to here. thank you. I had one land on the screen door. I was with this girl and she went out and it stayed and I went and got the phone and I petted this bird thought it might be sick it stayed for a few minutes. I deeply love this woman and she got pregnant afterwards. Her daughter had died this year and I seem to have wells of thought like when I touch the kids urn I get this hair raising feeling like when the spirit moves in church. Could you channel a child and give it back saw biblically the bird means resurrection. I thought maybe I had negative thought and not without reason cause she left me cause she says she loves another more. Did I sabotage it with thought. Today while sitting in the park with someone new that came into my life a flock of these birds came to nest in the trees above us. Earlier whilst walking with this new friend the same with a flock of blue jays kept flying past us and nested in the trees close as we kept walking. I am not sure if this is a sign of some sorts but any enlightenment would be much appreciated. I’ve been seeing a yellow one every morning for about a week now and I just don’t understand it’s meaning to me. There is so much going on in my life that I don’t seem to get it. I saw two goldfinches just a little while ago in my yard and it is a rare treat to see them. We’ve also had a terrible time in my family for 6 years. Today it is in crisis mode. From googling it, it seems goldfinch represents joy. I just pulled an angel card (I only do that when I’m desperate) and I got “Decide to be happy now–” more on the card: detach from drama, expect a miracle, write a gratitude list, maintain positive thoughts about this situation and open your heart to love. Hope this helps! I saw a large flock of goldfinch in my backyard yesterday morning. Probably 20 or 30 of them fluttering around for 20 minutes. Could this mean anything as I have been somewhat depressed lately. My boyfriend of 8 years no longer has any close contact with me and I am very sad. I did love seeing all of these birds. So pretty!! I love and am fascinated with birds but afraid to touch them- always have been Last night I dreamed I rescued a tiny goldfinch from a cat – I scooped it up in the nick of time and was carrying it in my hand looking for a box to make it a safe place til it could fly . I wasn’t afraid even when I could feel his little feet – I have a real problem w bird feet ! I felt very protective towards my little friend and clearly saw his yellow and black markings . I dreamt of a quite cute little neighborhood and m walking into someone’s front porch I noticed a bright yellow small blur flying around sort of a zig zag pattern. When I tied depicting what it was it flew closer and the yellow blur came into focus and saw it’s black wings it was a Gold finch. Next I was given a bouquet of bright yellow flowers in which I gave to a loved one. Just found a goldfinch on our patio. It appeared to be injured. It was vey calm. My husband put it in the palm of his hand and when he raised his hand the bird reluctantly flew away. It stayed on a nearby branch. We have been through a lot as a family for far too long. My husbands business was liquidated, fell out with family on both sides. I am taking our sighting of the gold chaffinch as a sign of better things to come, new beginnings and reconciliation. Just found a goldfinch feather on the grave of our pets. Not sure how to interpret this sign. It’s Labor Day weekend and I’m a teacher who’s returning to school. My husband and I are late 50’s empty nesters who like to travel and content to no longer have pets. Both adult kids have dogs and cats of their own. Maybe where I found it didn’t matter. soon after sitting on my front porch this past weekend marveling at the formation of the thunderclouds and approaching storm and saying a prayer of gratitiude, the storm clouds seemed to dissipate and about 2 dozen gold finches appeared flying in circles around my home and the 3 others next door. They were just dancing around the sky, above the trees. Two days before , a male and female gold finch landed on the top of my garden arbor. I thought the 2 of them were great; then a flock shows up 2 days later – wonderful! Certainly made me feel happy and fun watching them! I have been seeing a variety of birds just during the past week . One morning I saw starlings covering my neighbors yard, one evening I saw at least 20 hummingbirds flying over a field of flowers, I saw a cedar waxwing ( I think that’s what it was) in a garden I had never seen one before. I see eagles all the time, one afternoon there was one just above me holding in place motionless for several minutes right above me. This morning I saw 2 goldfinch that I haven’t seen for several years and a lone hummingbird and 3 eagles on the way to work. I have been hearing a bird for the past week that I haven’t heard since I was a child, I am 70. What on earth could be the messages that these birds are telling me? Sitting in my chair watching TV I saw 2 goldfinches brilliant yellow land on the screen of my screen door. They perched there a good long while as I said Hello to them and took a picture. This must have some significance with regards to a falling out with a family member. Making attempts at reconciliation, hope for a good sign. I am in a time of intensee depression due to the grief cycle of losing my husband. I also just found out that I somehow contracted HEP A, although this is a curable ailment, I am very ill and have to wait for it to pass. Sometimes it can take up to 6 months to recover… I dont have 6 months of recovery time with two babies to raise. Im wondering why the gold finch had made itself very apparent the past few days.. perhaps to aid in my strength to overcome this illness? So, I am recently clean. My journey has been interesting to say the least. I embarked upon this road of recovery as a result of becoming acutely aware of signs in my life. My eyes have remained “pealed” to say the least. There is a new person in my life. She is from Washington. As I enjoyed my morning coffee and reflection ritual this morning, I noticed this peculiar bright yellow bird. At first I just saw one and then another and another. Before I knew it, both my yard and the neighbors yard were covered. Curiously, I decided to Google and see what type of bird it was. 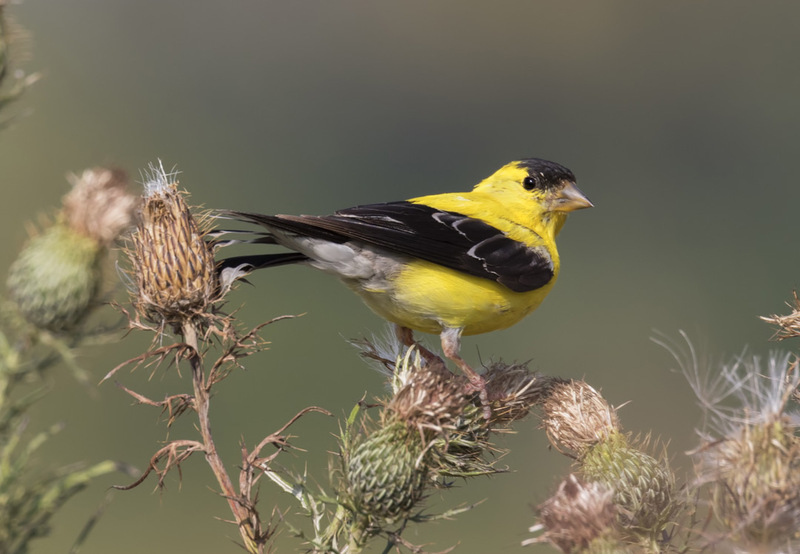 Goldfinch, the Washington state bird. That may not seem that strange but I live in Alabama. My dad was a wonderful painter of scenes of nature, birds, farm life, so many different scenes he could paint, very talented. My dad passed away in 2004. Greatly missed. I have a simple painting of his of a goldfinch in my living room. I have been going through some painful, personal situations over the past 3 years. Yesterday, I was blessed to see a goldfinch three times flying near by. So thankful, thank you, dad, I love you! Sooo funny! I have been having a hard time emotionally for a while now… especially the past week. I have been seeing a Goldfinch everywhere, everyday!! I’m at work and one flies by. I’m at home, and there’s one that visits daily and sits in my tree to sing and sing and sing… I never saw goldfinches the way I am now… I just looked this up and it warmed my heart, because I truly needed something to tell me to concentrate on joy this week!